Consumer Operated and Oriented Plan insurers (“co-ops”) are gradually going out of business. 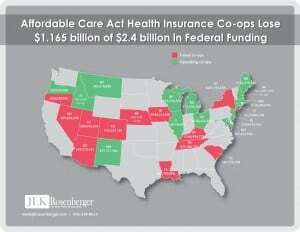 The Affordable Care Act (the “ACA”) in 2011 funded co-ops with $2.4 billion under a federal grant and loan program. Recently it was reported that 12 of the 23 health insurance co-ops have now failed, causing about 870,000 policyholders in 12 states – Arizona, Colorado, Iowa, Nebraska, Kentucky, Louisiana, New York, Nevada, Tennessee, Oregon, South Carolina, Utah and Michigan – to seek new coverage in 2016. According to the House Energy and Commerce Committee, the 12 failed co-ops represent a total cost to taxpayers of $1.2 billion. The co-ops were designed to broaden coverage options available to consumers, inject competition into highly concentrated health insurance markets and provide more affordable, consumer-focused alternatives to traditional insurance companies. However, operating co-ops comes with challenges and restrictions. Co-ops are required to accept every applicant, regardless of health status or preexisting condition(s) and cannot charge more for customers based on their medical history. Co-ops are limited in how much they can vary premiums based on age and tobacco use and cannot charge women more than men for a comparable policy. Co-ops must spend at least 80 percent of premiums on medical claims, known as the minimum medical loss ratio requirement. Co-ops are also required to reinvest all profits to improve pricing and/or benefits for members and are prohibited from using any federal funds for marketing expenses. The majority of co-op enrollment is required to come from individuals and small business, limiting penetration into larger markets. To buffer insurers from high losses in the initial years, keep premiums affordable, encourage insurers to participate in the health insurance marketplace, and minimize year-to-year premium fluctuations, the ACA authorized three premium stabilization programs: risk adjustment, reinsurance and risk corridor (the “3Rs”). From the 3Rs, in recent news, there has been controversy around the risk corridor. According to the Health and Human Services (the “HHS”) department, insurance companies will pay $362 million to the federal government’s shared risk program beginning this month for 2014 participants, but will be short $2.5 billion in payments they hoped to receive from the federal government. Instead the HHS is limited to pay out just 12.6% of insurer risk corridor claims, which may lead to the collapse of additional co-ops and other smaller health insurers. The National Association of Insurance Commissioners, which represents state regulators, believes there is no single reason why so many co-ops failed. Among the factors: co-ops were new companies, taking on patients they did not know and operating in a very competitive marketplace. The Inspector General of HHS provided similar reasons: higher-than-expected enrollment of people with expensive health problems, lower-than-expected enrollment of younger people and inaccurate pricing of coverage. If you’d like to learn more about the Affordable Care Act’s potential impact on your company, contact JLK Rosenberger today. For additional information contact us at 818-334-8624, or click here to contact us. We look forward to speaking with you soon.